Everyone will tell you that I am the biggest Disney fan they know. 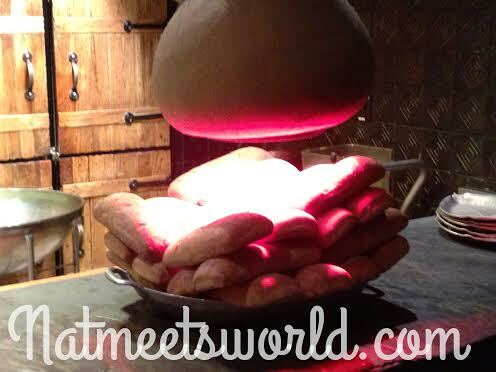 Every time I travel to Walt Disney World, I always try new restaurants and add them to my list. My significant other and I started a list of all of the restaurants we’ve experienced together since we started dating 6 years ago. We are now slightly over 200! On our most recent visit to the happiest place on earth, we decided to try Ohana, a buffet/family style dining table service that is out of this world! Ohana offers character dining with Lilo and Stitch (for breakfast only) and unique Polynesian/American cuisine for dinner.The atmosphere of Ohana is refreshing and gives you the complete Polynesian feel with its tropical, traditional hawaiian decor. It was a complete blessing that I was able to get a reservation at such a short notice, because I can honestly say, I called three times a day for a week and was told there were no cancellations or available spots. (Note to self and to you, reserve early as Ohana rarely has cancellations). There was a large crowd waiting around the restaurant to be seated, however, we were seated quickly since we had a reservation. 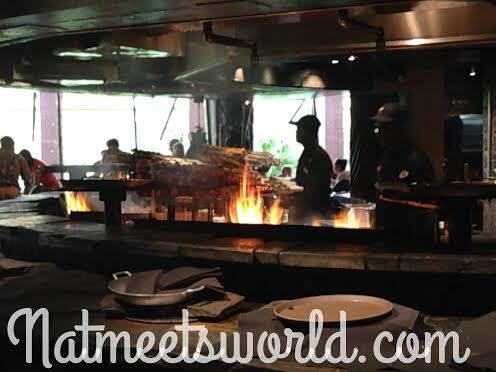 Ohana features an open grill where the chefs cook the star of your meal, the meat! Ohana offers several types of dishes throughout the course of your meal starting with the welcome bread and a mixed green salad with honey-lime dressing. If this dressing was available for purchase, I would have a month supply in my pantry. Delicious! 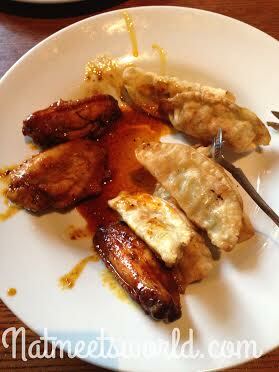 Next up, are exquisite pork dumplings with a sweet and sour sauce and honey-coriander chicken wings. These sauces are divine. I guarantee your party will be asking for more after trying these! (The best part about asking for more is that it’s included because its all you can eat! Yay!) 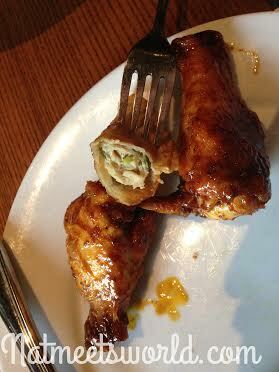 Even though you are going to want to order more of these, be sure to save room for more food, it will easily turn into your main meal since you can eat as much as you would like. Once you are finished with your appetizers (yes, those were all appetizers only), its on to the main course. Servers walk around the entire restaurant continuously with skewers that hold various types of meat including grilled chicken, Char-Sui pork loin, marinated sirloin steak, and spicy grilled peel and eat shrimp. You may ask for as much of any of these options throughout the meal. 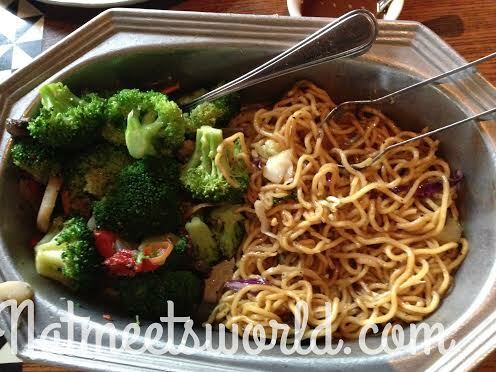 These meat choices are accompanied with noodles tossed in a teriyaki sauce with fresh stir fried veggies. By now you’re probably stuffed, and you’ve consumed more calories than you’re used to….but it doesn’t stop there. You MUST make room for dessert. 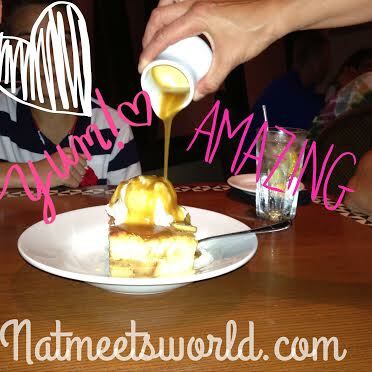 I am a dessert connoisseur, and I can honestly say that Ohana’s bread pudding a la mode with bananas caramel sauce is on my top 5 favorite desserts! You will be sorry if you do not try this delicious treat! Another perk to eating at Ohana’s with children is that there is a hula dancer/singer who gathers the children in the restaurant and travels with them in a conga line. The kids sing songs and dance throughout the dinner which makes it even more of a pleasurable experience. If you or any member in your party have dietary concerns (such as allergies or gluten free diets) speak to the chef prior to eating. They will accommodate any needs you may have. 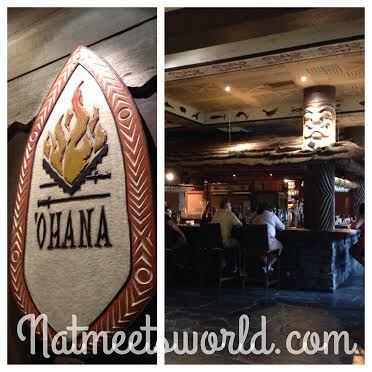 Be sure to try Ohana at the Walt Disney World Polynesian resort on your next Walt Disney World trip! Yo won’t be disappointed! Ohana breakfast ranges from $15-35.99 per person, and $36-$59.99 for dinner. Deal Alert: Some Disney dining plans are accepted. Disclosure: All comments, opinions, and experiences are my own. 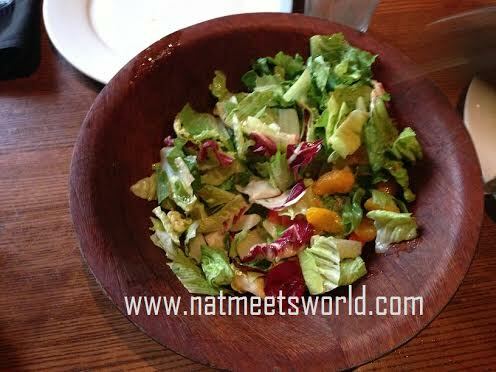 « Cuisinart Juicer Makes Eating Veggies a Piece of Cake!